07-Jun-2015 -- A gorgeous Sunday morning found me wondering what to do with such a fantastic day. 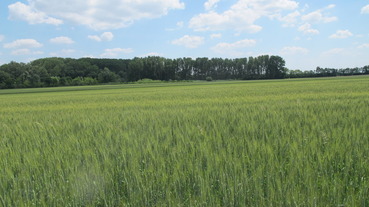 The day before I had been to the south of Vienna on Schneeberg so I decided not to walk in the mountains again but take a bike ride, a la Rainer Mautz, to CP N48 E17. I had already visited this CP (N48 E17), but that was on the 17th August 2004 so it was time to go again. After entering the CP into my GPS device, I saw the crow flies distance was 55km. Double that, add a bit, that seemed doable. So I set off. I followed route East that most cyclists take, along the Donauinsel, through the Lobau, past Schönau a.d. Donau and on towards Hainburg. Close to Orth a.d. Donau I took the passenger/cycle ferry over to Haslau a.d. Donau, and continued via Rohrau, Neudorf and Gattendorf to the CP. It was a pretty tough ride (for me), the temperature was around 30 degrees centigrade, and some of the tracks were unpaved. At the CP I parked the bike down next to a sweet corn field and headed for the CP. At my last visit there had been the sweet corn field on the left and cabbage field on the right. This time there was corn or barley on the right. After a 100 metres or so it became clear that I would not get too close to the CP - the closest distance without walking into the corn field was 65 metres and not wanting to damage the crop left it at that. It was close enough anyway, being less than the required 100 metres. So I took the usual photos and returned back to my bike and headed off back home via Bad Deutsch Altenburg, cycling over the river near Hainburg, and heading westish along the dam back to Vienna. The total distance was a little over 140km. So I had managed to use the weather, take a short ;-) bike ride and re-visit a CP.